As we begin this adventure of Youthmark Mission Ventures this weekend and early week, we are releasing the second edition of move: Mission Prep Workbook. 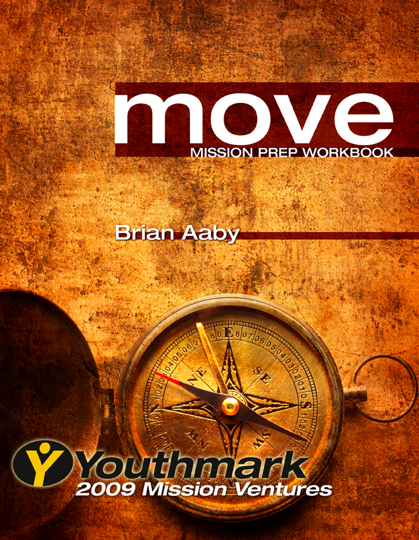 Last year, nearly 250 students and youth leaders used move as their training workbook/study for summer missions. I had great reviews, feedback and helpful tips. After many hours (thank you to the edit team) and some very cool enhancements (thank you graphics folk) I’m quite pleased with the new version. The editing is done very well and we were able to enrich it with very sharp graphics and text design. The youth leaders on the retreat Monday/Tuesday will get the first look. The title, move, is a play on words, In Acts 1-6 the believers (including the Apostles) are all still in Jerusalem. This workbook is a study of those early stages of the church (followed by the disciplines we see them practicing). Because the disciples were “stuck” in Jerusalem-doing the work of the Lord, I believe our to-be missionaries should do the same for their own Jerusalem. Pray for the leaders as they discover the way the book can be used and ask the Spirit to move in them as they bring it to their groups! Love the look of the new book. Awesome! I hope the training is going great! I can’t wait to hear about it when you’ve got time. I’ll catch you up on a few things here then too.